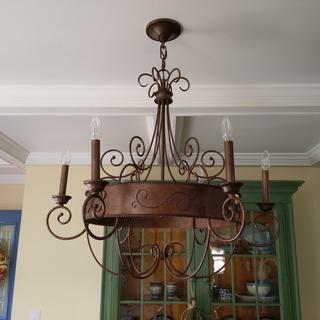 Add decorative scrolls and a charming candelabra design to your home with this bronze rust chandelier. This eye-catching chandelier will bring delightful style and charm to any room. This 6-light design features a metal frame generously adorned with scroll work throughout. Traditional candle slips add a nostalgic touch. 30" wide x 29" high. Canopy is 5 1/4" wide. Weighs 17 lbs. 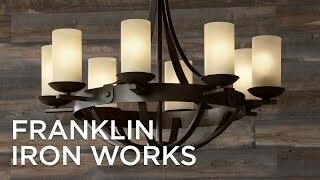 Rustic, vintage-look candelabra chandelier design from the Franklin Iron Works™ brand. Rust bronze finish, metal construction. Traditional candle sleeves for the bulbs. 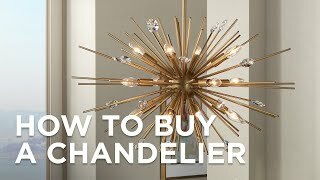 This seems to be a rather unique design compared to current chandelier trends. It has a country french feel to it which I think will fit in with the decor in a my kitchen nook. I like the Spanish flair! I chose the Franklin Iron Works 30 inch Wide Rust Candelabra Chandelier because it will match our rustic farmhouse theme in our new home. It will be placed over our authentic farmhouse table from the 1860's. I am beyond excited to receive the chandelier and install it. Love the ornate look of all of it. Moving to Tahoe and love the rustic look! For over our dining table.....very excited about this one! I've had this on order and just received it...does anyone know if t is "dimable"? Or does that depend on the bulbs? Do they have pendant light to go. With Franklin iron works y2301.? BEST ANSWER: Hi, this chandelier does not offer matching pendant lights. 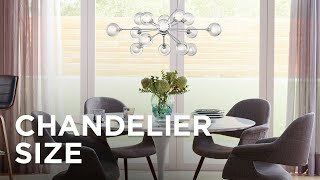 There was not a collection including the pendant lights for this chandelier, but I loved the chandelier so much I did find pendant lights at Lamps Plus that looked nice with this chandelier. Also, if you call the company, they are so nice and can suggest pendants according to the style you might like. I believe they might be able to look up my order and let you know what I purchased from them. Says 11 feet of wire and only 6 feet of chain...am I missing something...I need more chain? Is this rated for damp location? BEST ANSWER: No - this is not damp location rated. It's at our cottage which is on the Great Lakes. Always damp there. Is the 30'inch diameter too large in bedroom over king size bed; ceiling is 10 feet? BEST ANSWER: To determine the width needed, add the length and width of your room and convert the total to inches. For example, a room that's 12-feet x 14-feet would require a design that's around 26-inches wide (12 plus 14 gives you the width of 26). which bulbs looks the most natural? LED or regular bulb? BEST ANSWER: That is a matter of personal preference. Generally, incandescent bulbs have a softer warmer glow. However, the filament LED bulbs also offer a warm soft glow. BEST ANSWER: Yes, it will look great. I have 9' ceilings and it is hanging over a standard height dining table. We used 12 of the chain links. I think you would probably want to use fewer links over a high top table. 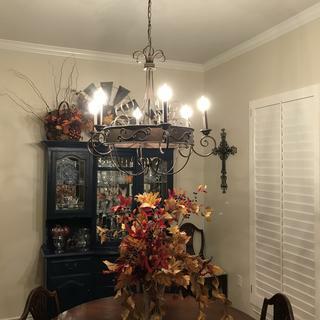 We have 31" between tabletop and bottom of chandelier. Hope this helps. Yes. I think it would work. I have this chandelier in my dinningroom and my ceiling is 91/2 feet tall. 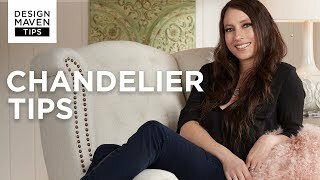 The chandelier is absolutely beautiful, we love it !I think it would look great, it's not real bulky and has a more delicate appearance. I have mine hanging over my dining room table. We have 9 ft ceilings. I must say I absolutely LOVE it. Our dining room table is very large and square and old. Good luck! Can I use it on my patio? BEST ANSWER: We don't recommend using this chandelier outdoors. It's been designed for indoor use, and doesn't have any special primers to help protect the design from the elements. What ceiling height is this best for? BEST ANSWER: Depends on where you are going to hang this chandelier. I have 9' ceilings and I have it over a dining room table. 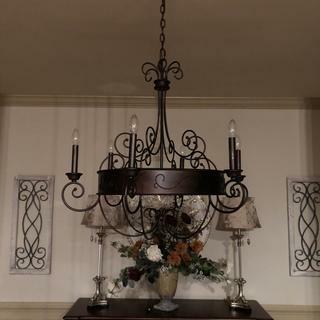 We used about 18" of chain so the bottom of the chandelier is about 47" from the ceiling. For me it looks to be a perfect height for over a table. However if you are hanging in an entryway I think you would want at least 11' ceilings. That would give you a clearance of 7' to walk under it if you used 18" of chain. By the way, I love this chandelier. We have a 10ft ceiling and it works perfectly over the dining room table. Lots of compliments on it too. I have two separate islands I put the over. The ceiling is 9'. Gives me just the look I was going for! I love this light. I have a dark room and it illuminated the room beautifully. I ordered this for my dining room table and I am really happy with the appearance. It gives plenty of light to the area and I receive so many compliments. 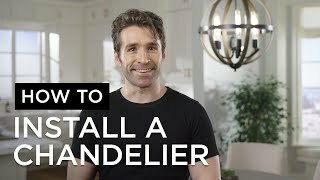 I was searching for a rustic chandelier that would compliment my vintage refinished farmhouse table in my small dining room. I was worried this chandelier would be too large but it is absolutely perfect. Just what I wanted! And I got it on a flash sale so that made it even better!!! It will take 2 people to hang due to its size and weight but worth it! It is very well made. I definitely recommend this light fixture. Ordering process was so simple. Service representative was very friendly & helpful. Delivery was prompt & arrived in perfect condition. Stunning chandelier is exactly like the picture! 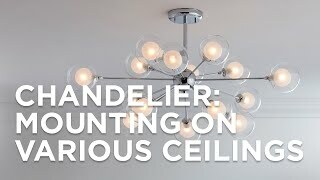 We bought this gorgeous chandelier and installed it in the master bedroom on a dimmer. We get compliments all the time about how unique and stylish it is. The amount of light is perfect an it casts lovely shadows across the ceiling. The rust colored fixture goes perfectly with our modern urban and slight rustic style. I liked that it has a rustic look without being too overpowering above my high-top table. The lighting is just right due to the number of bulbs. I am very pleased with the purchase. knew this was going to be fantastic the minute I? saw it . It is stunning . I? love the tradition / rustic blend of it . 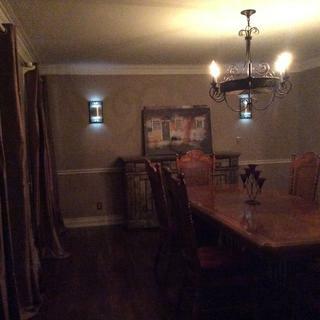 I couldn’t t find the right lights anywhere for my dining room. We were looking for months. 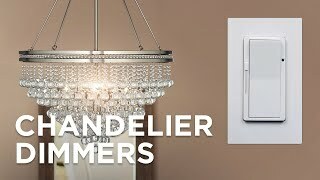 I found this chandelier and wall scounces by googling. The lights were delivered in less than 10 days and arrived in perfect condition. They look more beautiful in person even than they did online. This my second Franklin Iron Works Light very good quality. Perfect, gorgeous antique piece. Love it. Absolutely love my new light and it looks gorgeous over my dining room table. Highly recommend! It’s even better in person! Heavy with lots of personality. Love love love! Easy to assemble and everything was included for the installation. We're pleased with the quality and appearance of it. 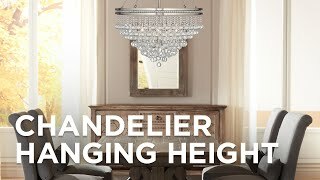 A polished nickel finish orb chandelier with a slenderblossoming candelabra design by Hudson Valley Lighting. The twelve lights in this salmon rust drum chandelier glow from inside beautifulstylized candle-like cylinders. The ring-style design of this hand-crafted eighteen-light dark rust chandelier is a blend of contemporary and traditional inspiration.